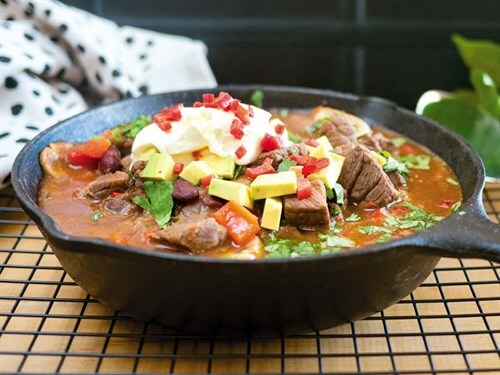 Check out this quick and easy recipe for Mexican chilli beef that you can try in your motorhome or caravan. This has to be one of our favourite ways to feed the family when we all get together. The Mexicans certainly know how to feast and this dish certainly adds 'spice' to an evening. We had a bumper crop of chillis this year and it was so satisfying being able to go to the garden and harvest large, beautiful green and red chillis for this recipe. The seeds were removed from the chillis for the cooking process but the last one was sliced, seeds and all, for the final punch. The chocolate added at the end is sheer indulgence and it's even better if you can source Mexican dark chocolate. Heat the oil in a large saucepan and gently saute the onions until translucent, approx 10 minutes. Add the chillies and mushrooms and continue to cook for 5 minutes. Sprinkle on the seasoning mix and stir to combine. Remove the onion mixture and set aside. Add another 3 Tbsp of oil to the pan and over medium to high heat brown the meat in batches. Return the onion mixture and meat to the pan then add the tomatoes,cumin, cinnamon and beans. Stir together and bring to the boil, reduce heat to a low, cover and simmer gently for 1.5 hours or until the meat is tender. Just before serving stir through the chocolate, capsicum, chilli and coriander. Top with chopped avocado and dollops of sour cream.